Even though the graphics industry is highly automated and generally designed for the output of large quantities, there is still a need for precise and robust manually operated machinery for the manufacturing of samples, tests or small production series. BAIER machines are mechanically stable, can be set up in a flexible manner and are easy to operate. Our GEBA 1/A unit is a universally usable, manually operated machine, which is used in leather processing, in the plastics sector and for manufacturing promotional items. This small machine is as versatile as a Swiss Army Knife and can be adapted for a variety of different stamping tasks quickly and easily. Our GEBA 1/F is the ideal machine for manual bookbinders or sample makers. It can be used to stamp short runs quickly and easily. Even photographers and artists, who would like to provide their works with unique decorations, are capable of solving this need using the GEBA 1/F. 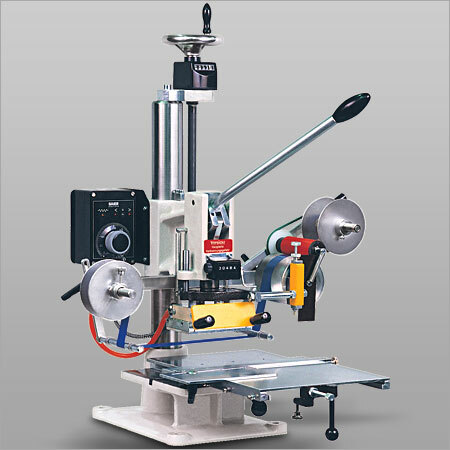 This manually operated machine with a sizable jib length is supplied with a clamping frame for type.